It’s been a while since we had the chance to see a Ryan Power show. Let alone a RP gig with a full band. This could be somewhere along the lines of their 6th gig and possibly first with this updated crew. All and all its going to be a great night of music before the band hits the road for a 3 week tour down to SXSW and back. Last time at the 5th Element 200 + folks showed! Get there early! 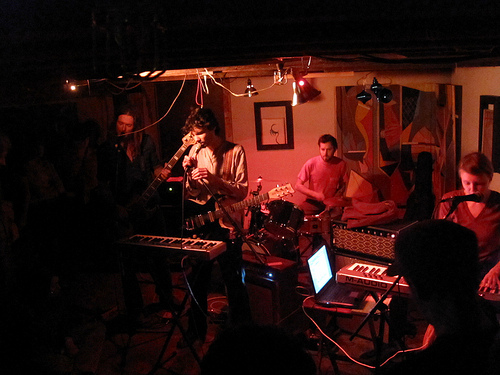 Ryan Power is a four piece band from Burlington, Vermont, and also Montreal, Quebec. hooks, rhythm, synths, and soul, with some funk and prog in there too. If you can’t make it and are between Burlington and Texas, you have 18 other chances to check them out. Some rad shows with the likes of Grandchildren, Lucero, Little Women, Magik Markers, Royal Osprey and Casiotone for The Painfully Alone to name a few…. w. True Widow, The Name, Beach Fossils, Grandchildren, Hot White, TV Ghost, Fang Island, Quiet Hooves and more! This entry was written by nmavodones, posted on March 2, 2010 at 5:50 pm, filed under Local Music and tagged Blowtorch, CD Release Party, Full Band!, I Don't Want To Die, Laser Tag In The Morning, Lawrence Welks & Our Bear To Cross, Ryan Power, The Monkey House. Bookmark the permalink. Follow any comments here with the RSS feed for this post. Post a comment or leave a trackback: Trackback URL.